I have been eating a lot of pizza lately!! Ever since I discovered Daiya cheese it's my new favorite thing. Last week I posted that I made some pizza using Kinnikinnick crust and the awesome folks at Udi's offered to send me some of their crust to try since I hadn't found it yet at my local shops. The Kinnikinnick crust was great but the Udi's crust is even better!!! It's thin and crunchy and doesn't get mushy under the toppings. 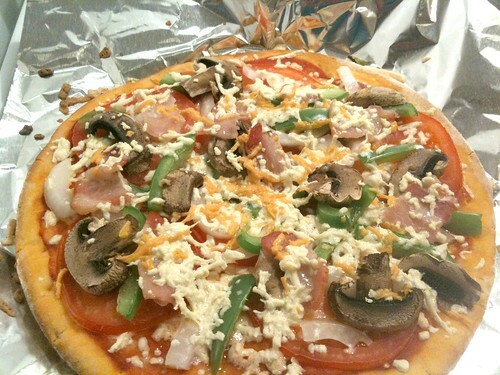 I piled this pizza high with sauce, slices of tomatoes, onions, peppers, mushrooms and both mozzarella and cheddar style Daiya cheese.. oh and also a couple slices of Boar's Head bacon!! Delicious. The only thing I noticed about this crust that I don't love is that it's got a lot of dust on it, like extra flour dust. I do like a little flour dust on my pizza crust but I thought it was a little excessive here. But really, other than that, this is another amazing Udi's product!!! This looks great! Thanks so much for sharing! Wow that looks good! I can't wait to get my hands on some Daiya cheese!